Communication through volatile chemicals is ubiquitous, and for insects, it is the dominant way information is sent and received. With such a heavy reliance on volatiles for host, mate and threat detection, targeting this modality to alter insect behavior can be highly effective. Semiochemicals are frequently deployed for pest control purposes. For example, aggregation pheromones can be attached to traps in an attempt to stave off an outbreak. The compounds used are often synthetic blends mimicking those utilized by insects to locate a host or a mate, but what if we also simulated predation risk? 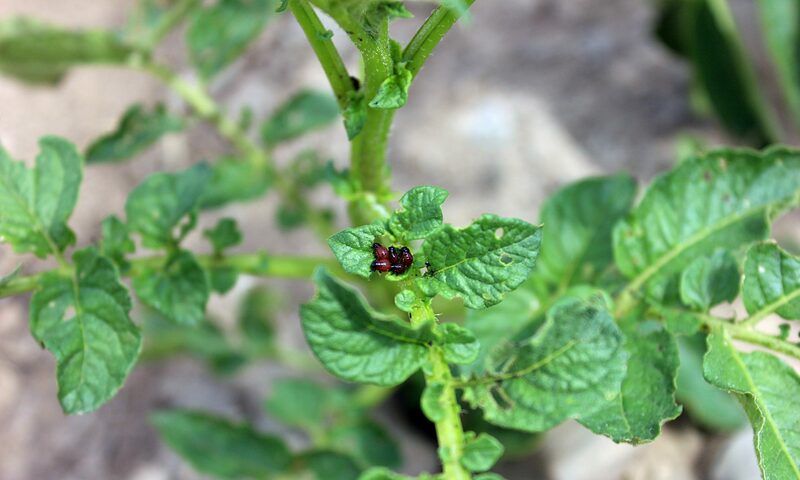 Using the smell of predators to protect potato plants from Colorado potato beetle. Plots that smell like predators receive significantly less beetle damage and eggs. When an herbivore, say a crop pest, intercepts the pheromone of a predator, they can respond by reducing feeding and the number of eggs they lay, or drop off the plant to avoid predation. These behavioral changes have the potential to significantly reduce crop damage without the use of insecticides.